What on earth was Truman Capote doing at my computer desk? I had no idea. It wasn’t Truman Capote of course, but C.W. enjoying one of his sight gags. I heard him from the next room and walked in just in time to hear him muttering. You know, he had a point. “Not really,” I said. “Uh, C.W. …” I said. “Can’t talk now,” he said. “Busy.” He turned back to the computer and resumed his dialogue. “C.W.,” I said in my firmest voice. I couldn’t stand it anymore. “Stop, stop, stop,” I said. He pursed his lips and said. 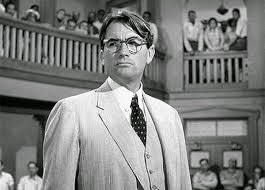 “Well at least hear my new ending.” Before I could respond, he grabbed a sheet from the table and read, “Atticus would, like, be there all night, and he would, like, be there when Jem waked up in the morning ... awesome." have a real hero. - C.W. Click an add, like, to help my new company.